Rubesch, T., & Barrs, K. (2014). Supporting a physical self-access center with a virtual presence. Studies in Self-Access Learning Journal, 5(1), 42-49. This article describes the motivation and reasoning behind an ongoing project to create an online presence of a Self-Access Center (SAC). The project involves the selection and integration of a number of technologies which work to together to supplement the physical SAC. The authors argue that such projects have value both for the institutions which host them, and also for the learners they serve, such as support of individualized and independent learning, promotion of the SAC, and hosting and archiving resources. Establishing an online presence allows learners much greater freedom in when, where, what, and how they study. Self-Access Language Learning (SALL) has come to be widely recognized as an essential component of a learner’s language development (Benson & Reinders, 2011). One of the fundamental concerns of SALL is with the promotion of learner autonomy by creating opportunities for out-of-class study, practice, and use of languages. In this sense, SALL involves expanding learners’ access to resources, services, and facilities for language study. Journals, conferences, and academic societies have been established to cater for the research conducted in this relatively new academic field. Concurrently, language learning institutions around the world have invested in the construction of Self-Access Centers (SACs). However, SALL, which occurs within the physical confines of a Self-Access Center, is in some ways paradoxical. Whilst the SAC may offer learners the physical space to pursue their autonomouslearning, it is this same space which in many ways restricts the extent of autonomy. To begin with, a major concern is that the actual self-access possible in a SAC is limited by the number of resources it can hold, facilities it can offer, and hours of service it can provide. Another question arises as to how students come to enter this physical space: if they are required to go into the SAC, this may be in opposition to the very notion of self-access (see Cooker, 2010). However, if no such requirement is made, possibly only those students who already have an understanding of the nature of SALL will avail themselves of the resources. If learner autonomy is to be truly realized, there needs to be a lifting of these “restrictions” imposed by the physical SAC. The nature of language learning, and SALL in particular, is changing (for a discussion of this point, see Reinders, 2012). The Internet, computers, and mobile devices have not only increased the quantity and quality of self-study materials, but have also made these resources much more widely and easily accessible. In the current age of ubiquitous digital technology (Sampson, Isaias, Ifenthaler & Spector, 2011), it has become possible to supplement the physical SAC with a virtual SAC, allowing learners much greater freedom in when, where, what, and how they study. 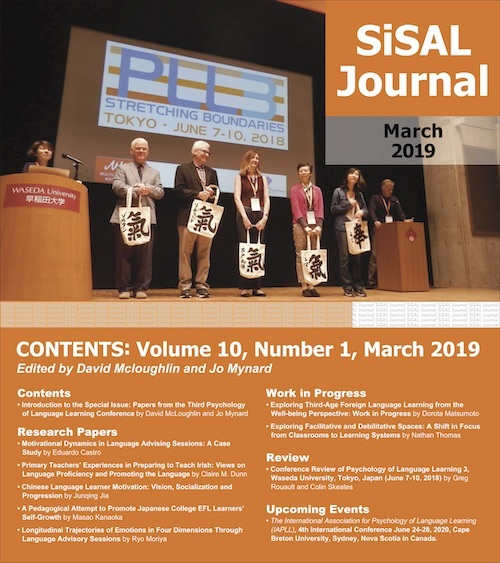 Accordingly, the Self-Access Learning Centre (SALC) at Kanda University of International Studies (KUIS) in Chiba, Japan has been focusing on creating an online presence to augment its physical space. This was considered both timely and logical as not only was there an expansion of wireless Internet across the campus, but also a general proliferation of mobile devices and social networking services being used by the students (Barrs, 2011). Furthermore, SALC users had previously demonstrated an interest in using technology for language learning (Castellano, Mynard, & Rubesch, 2011). This article reports on the developments made over the past three years in creating an online presence for the SALC to supplement the physical center. With A Successful SAC, Why an Online Presence? Reinders and White (2011) state that “technology has the potential to not only provide access to resources for learning in a superficial sense, but also to offer increased affordances for autonomous learning” (p. 1). In this way, technology can liberate self-access learning from its physical confines by vastly opening up the volume, velocity and variety of resources available to the learner. These three concepts are commonly associated with the idea of ‘Big Data’, where the amount (volume), the speed (velocity), and the diversity (variety) of data are presenting modern society with a wide array of affordances and challenges (Zikopoulos, Eaton, deRoos, Deutsch, & Lapis, 2012). However, they are also applicable to the area of SALL, where the number of self-access language-related resources which can be used, the speed with which they can be accessed, and the variety in which they can be found continues to be transformed by advances in web-based technologies. This increase in the volume, velocity, and variety of materials which can be accessed by the learner is especially true in the current context of an ‘always-connected’ society. More and more people are able to access the internet 24 hours a day through mobile devices such as smartphones and tablet computers and have access to a myriad of websites, as well as social networks such as Facebook, Twitter, and LinkedIn. In such a context it is increasingly difficult to imagine a business or institution without some sort of online presence: a primary “home” on the internet designed to provide stakeholders (be they customers, clients, or users) with, at the very least, basic information such as contact details, opening hours, and answers to frequently asked questions. Recognizing the mutually supportive and interconnected relationship between the physical and virtual worlds, the materials development group undertook an ongoing project to develop and manage an online presence for the SALC at KUIS. When creating an online presence, the developers were conscious of augmenting the physical space and strove to incorporate principles of autonomous learning – not merely inundating SALC users with unguided choices. Sheerin (1997) states that “proponents of self-access centres put forward two main reasons for their advocacy: the pragmatic- individualization, and the ideological- promotion of learner independence” (p. 55). Although Sheerin was referring to physical SACs (and was writing before the widespread use of the internet in educational contexts) we believe that the same two qualities can be enhanced by expanding the scope of SACs into the online domain. TheSALC website hosts and curates several pages of external links for language learners chosen to compliment the programmaticgoals of the center and the center’s host institution. These pages, which emulate and supplement the physical SALC’s subject areas, are chosen specifically to compliment and expand the materials on the shelves of the physical center (reading, grammar, pronunciation, learning with music, etc.). The pages feature several links which are vetted and recommended by SALC users and learning advisors. Each link is explained with a brief overview outlining its strengths. This provides users with essential guidance in choosing appropriate autonomous learning websites (Murray, 1999). Similar to the SALC website, online social networks (i.e. a Facebook page and Twitter feed) are used in order to connect students with external language learning opportunities. By using these two widely popular social networking services, a large number of students can be quickly and easily reached and informed about pedagogically useful resources found across the web. These external resources have been chosen to complement existing materials in the SALC, such as vocabulary level check sites, grammar quizzes, online listening activities and graded readers. Furthermore, Facebook and Twitter are used to link to websites recommended during language learning workshops run in the SALC, and in this way these two social networks act as an extension of the workshops, allowing students to access further online learning resources in their own time, wherever they choose. This also allows students who are unable to attend the workshops in person to still be able to benefit from them, again increasing the reach of the SALC’s materials, resources, and support. In terms of offering SALC users choice, flexibility, and agency in meeting their language needs, an online reservation system was establishedfor booking appointments with learning advisors and writing center tutors, as well as reservations for the center’s regular workshops and facilities (i.e. speaking booths and multi-purpose rooms). They also directly connect the online space with the physical space by expanding the scope of the center. In order to even further extend the accessibility of materials in the SALC, mobile device-readable QR codes are posted on the shelves of the center to connect the areas to the above-mentioned links for language learning, thereby encouraging students to further their study with the recommended online resources hosted on the website. The ubiquity of Facebook and Twitter as primary online social networks around the world means that they are very effective platforms for disseminating information quickly, widely, and effectively. Not only can students who have “liked” the SALC’s Facebook page or followed the Twitter feed quickly see postings and updates, but if they interact by “liking”, commenting, or re-tweeting, there is the potential for their friends to see the postings and updates too. Furthermore, as long as students have a Facebook account, they can read the postings on the SALC’s Facebook page without being forced to actually “like” the page. With Twitter, the SALC’s feed can be seen regardless of whether or not the learner has a personal account. This allows an important privacy option if students would rather not link their own Facebook or Twitter accounts with that of social media sites managed by the university. The Facebook page and Twitter feed are used to link to useful language learning resources found elsewhere on the web, to promote SALC-related events such as parties, competitions, and workshops, and to link-in with announcements and updates on the main SALC website. It was hoped that using these sites for these purposes would help extend the reach of this information much more quickly and widely than was possible with traditional forms of promotion, such as posters and leaflets put up around the SALC. Furthermore, Twitter parties (commonly referred to as Tweet-ups) are held in the SALC to celebrate milestones in reaching a certain number of followers. These events are advertised only via Twitter and are another chance for the virtual world of Twitter to link-in directly with the physical goings on of the SALC. They are held at lunch time and include drinks, snacks, quizzes, and conversations. They have also been a very valuable time to garner opinions on how learners best like to use and interact with the Twitter feed, as well as provide an opportunity to discuss technology in the SALC in general. In a similar fashion, the main page of the website hosts promotional announcements, as well as the latest Tweets and links to the social media sites. In addition, an integrated image sharing site (in this case, Flickr) allows the center to share promotional photos of events. Such sites can also provide a platform for student visual work and further community building. A further benefit of an online presence is that of collecting promotional and archival content. The website has proven an optimal place to share copies of the SALC’s quarterly newsletter. Social image sharing sites allow the SALC to publicly archive event photos. The site also creates a repository of workshop materials and hosts independent module-course materials. An integrated online presence allows a new dimension to be added to the term self-access. This dimension is a virtual one, where restrictions concerning learners’ access to language materials can be lifted. It allows for new and creative ways to foster a self-access learner community and to promote a center’s events, services, resources, and facilities. Furthermore, it allows for archiving and hosting in-house learning and promotional materials. This article has outlined the major technologies introduced in the development of the online presence of the SALC at KUIS and has shown the main functional areas that these technologies serve. The development of this virtual side of the SALC is very much a work in progress, and is necessarily flexible and adaptive to the changes inherent in the technologies. The authors argue that such projects have value for both the institutions they represent and the learners they serve. We agree with Mynard (2012) that “a self-access facility is much more than just a library of resources” and do not foresee (or advocate) the expanding role of an online presence as a path leading to the end of physical SACs. Indeed, learners will need guidance in selecting and using the materials offered in the virtual SAC just as they need it in the physical one. Therefore, we feel that virtual components both complement and enhance the physical SAC while adhering tothe core principles of self-access. Troy Rubesch is a senior lecturer at Otemon Gakuin University in Osaka, Japan. He earned his MA in Second Language Studies from the University of Hawaii. His professional interests include Computer Assisted Language Learning (CALL), specifically language education software and distance language education. Keith Barrs is an associate professor in the department of English language and literature at Hiroshima Shudo University. He is primarily interested in the analysis of language in use, specifically with what can be revealed by loanwords in a language through reference to corpora studies. His current research is concerned with the semantic behavior of English loanwords in the Japanese language. Murray, D. E. (1999). Access to information technology: Considerations for language educators. Prospect, 14(3), 4-12. Sampson, D. G., Isaias, P., Ifenthaler, D., & Spector, J. M. (Eds.). (2011). Ubiquitous and mobile learning in the digital age. New York, NY: Springer. Sheerin, S. (1997). An exploration of the relationship between self-access and independent learning. In P. Benson & P. Voller (Eds.) Autonomy and independence in language learning (pp. 54-65). Harlow, UK: Pearson.